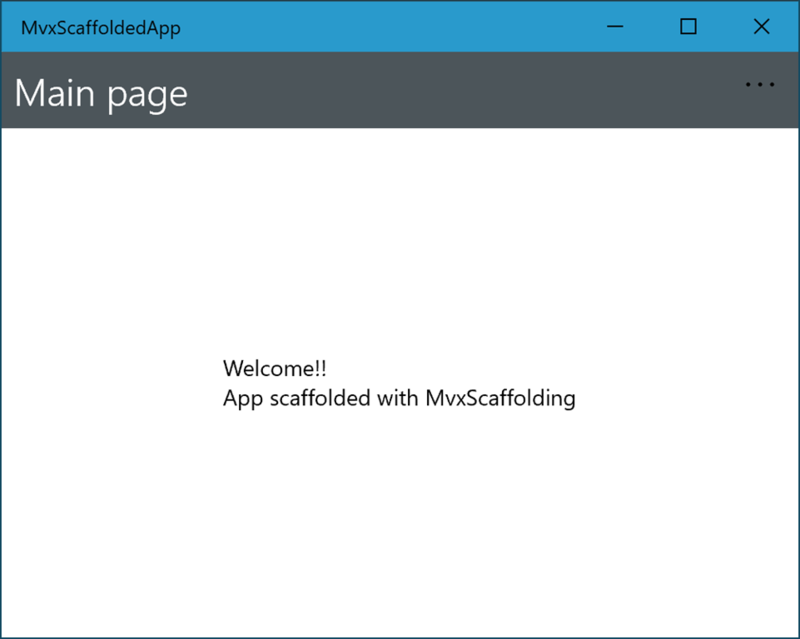 Now we’re into the MvxScaffolding custom dialog – wow, look at how nice this is. I went with the Single Item template – it’s a tad confusing that you have to click on the grey circle to pick each option, rather than clicking the whole card. 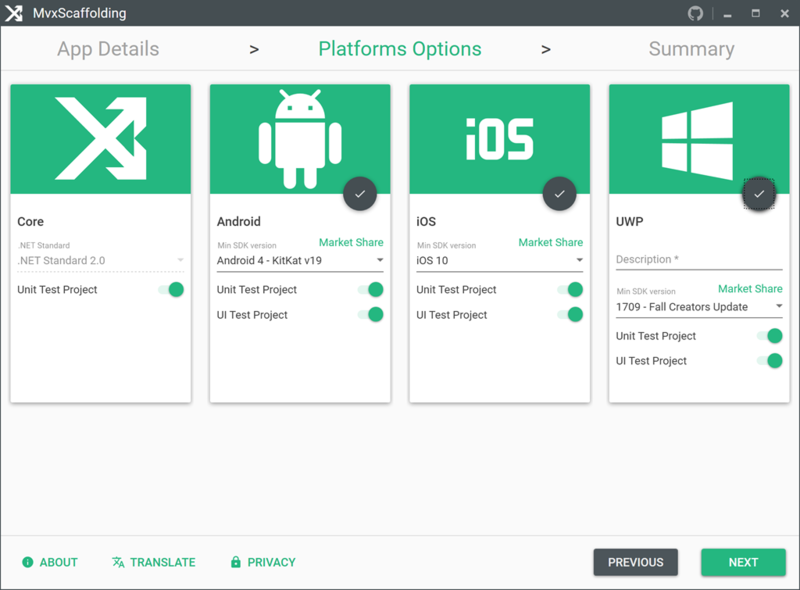 Next up, pick the platform and which test projects you want generated. And of course, the running application. This was a bit mind blowing to be honest – the level of detail in this extension was awesome and I was able to generate the runnable application in under a minute. 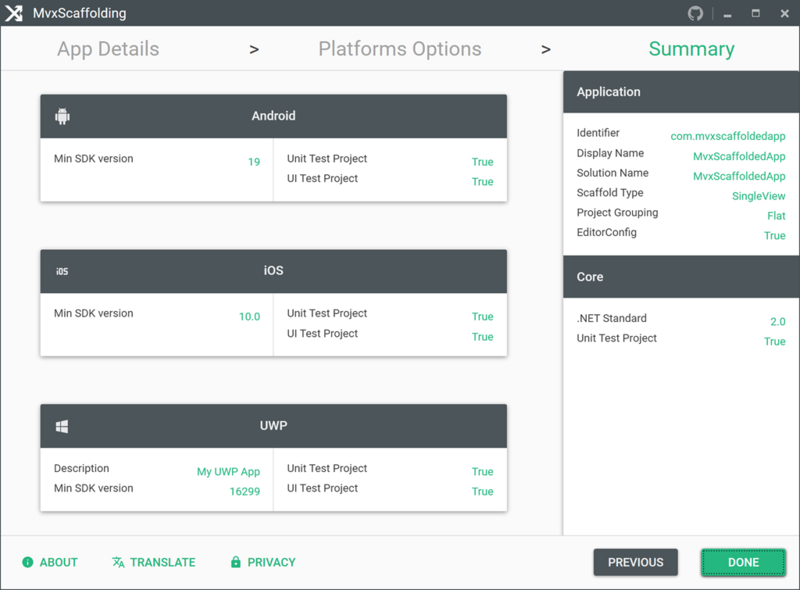 I like the way the projects are separated and that it can generate all the test projects. When we kicked off this project we separated out the business logic from the user interface into Core and UI projects respectively. The main aim was to ensure clear separation of context and to allow for the business logic to be developed, and more importantly, tested, independently of the UI. In this post we’ll get started with unit testing our Core library using xUnit. 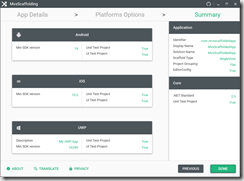 I’ll also touch on using the mocking library, Moq, to make our testing lives easier. 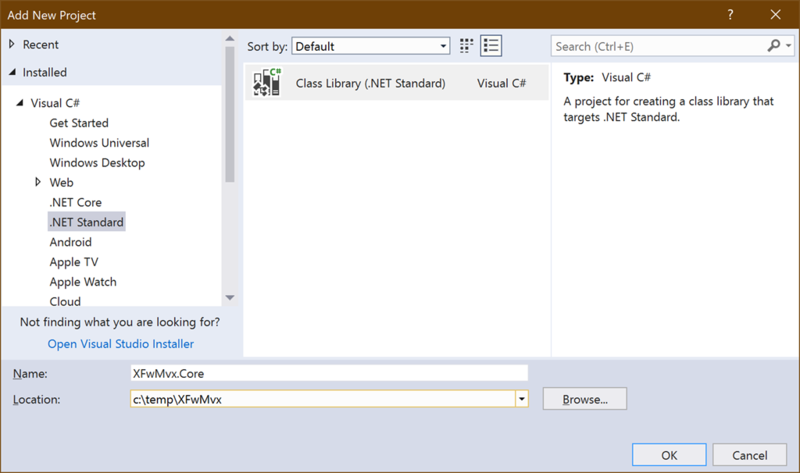 To get started we’ll add another project to our solution, this time based on the xUnit Test Project (.NET Core) from the Add New Project dialog. 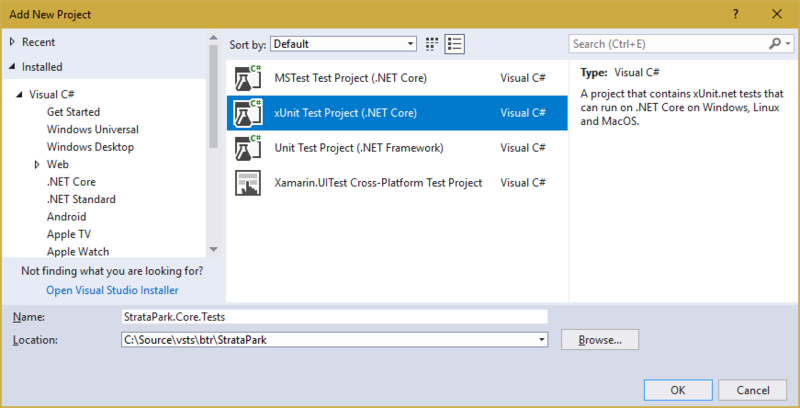 If we inspect what gets added we’ll see that it’s a regular single targeted project with references to xUnit and the Microsoft test library. 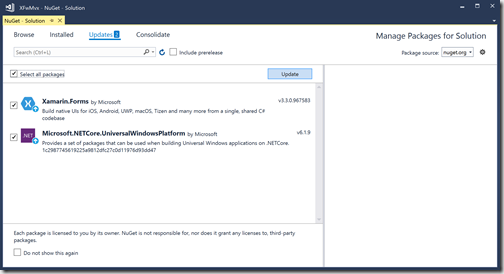 After creating the project, don’t forget to do the obligatory NuGet package update. 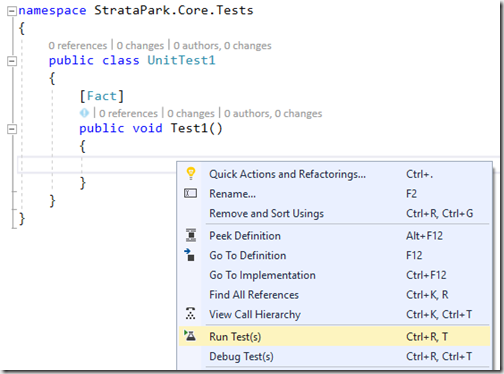 If you open the UnitTest1 class you can right-click within the Test1 method and select Run Test(s). When you execute tests within Visual Studio you can see the execution progress in the Output window. If it doesn’t automatically switch, you may need to select Tests for the “Show output from” dropdown. 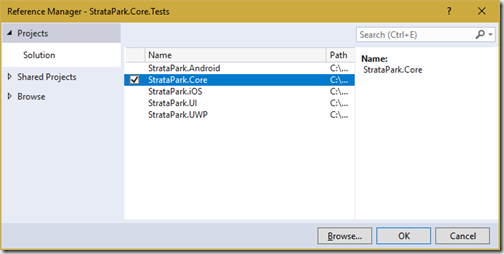 Before we can write tests for our Core library, we need to add a reference to the Core library to the Testing library. 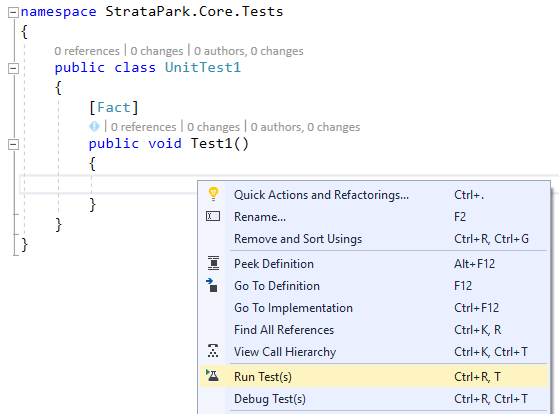 Now we’re ready to start creating our own tests (you can delete UnitTest1.cs since we won’t be needing it). 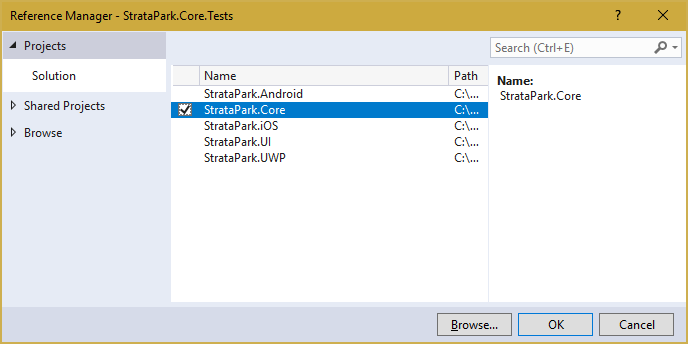 Everyone has their own naming convention and structure for testing library. I tend to mirror the layout of the project I’m testing. 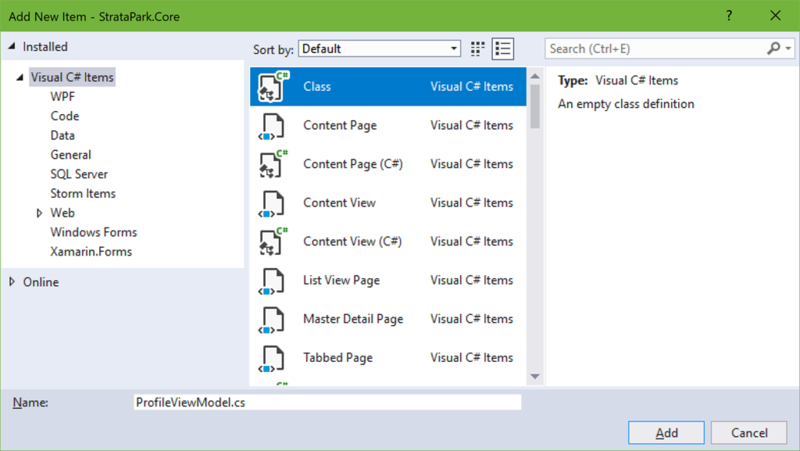 So in this case I've created a ViewModels folder within the test project and have created a class MainViewModelTest class. Here I’ve kept the AuthenticateTest method relatively straight forward – I created a mock instance of the ICredentialService which returns a predefined access token; this is then used along with two other mock objects when creating the MainViewModel instance. I then assert that calling the Authenticate returns true (i.e. because the Authenticate method on the ICredentialService instance returns a not-null access token). Right-click within this test method to run the test returns a positive outcome in the Output window. 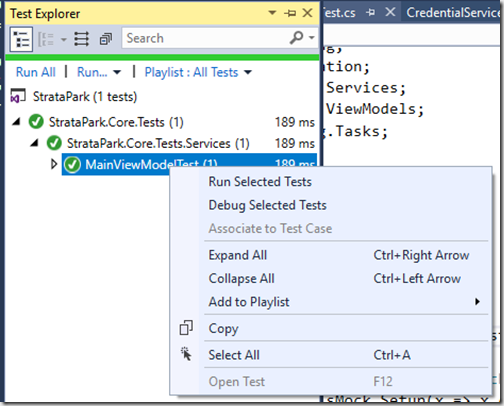 You can also run and see the results of running test cases via the Test Explorer window. 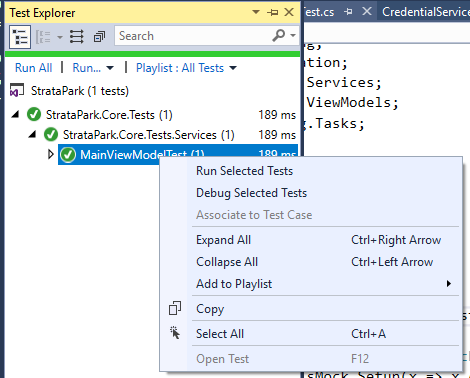 And that’s it, you can now write as many test cases as you feel are necessary for your services, viewmodels and other Core classes. Last post I covered how to use OnPlatform to tailor resources and styles based on the target platform. However, there is an alternative dimension you can tailor the layout of your application and that’s using OnIdiom. 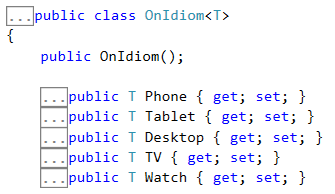 If you look at the definition of the OnIdiom class you can see that it allows you to define different values for Phone, Tablet, Desktop, TV and Watch. 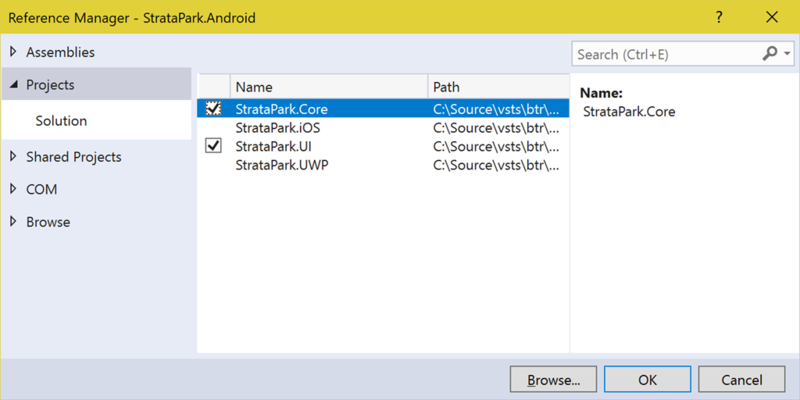 As you can see from the code snippet this provides different string values for when the application is run on a phone vs being run on a desktop. Note: Tablet only works well for iOS and Android. 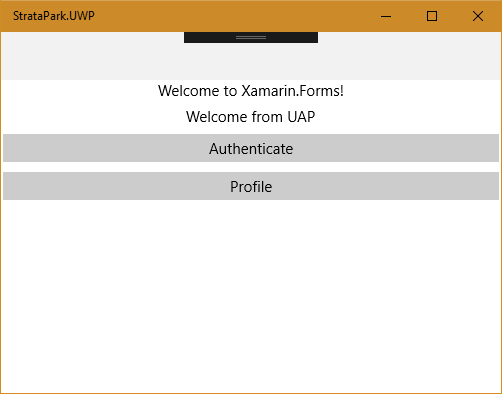 Xamarin.Forms running on UWP currently doesn’t distinguish between Windows running in desktop or tablet mode, and as such will always use the Desktop idiom values. In previous posts we’ve looked at using resources and then styles and resource dictionaries in order to manage the style of elements throughout our application. 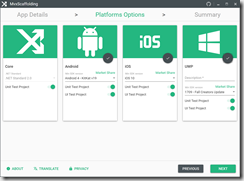 Whilst Xamarin.Forms provides an out-of-the-box cross platform experience, the reality is that if you don’t tweak the layout a bit for each platform, your application is going to look very generic, and not in a good way. 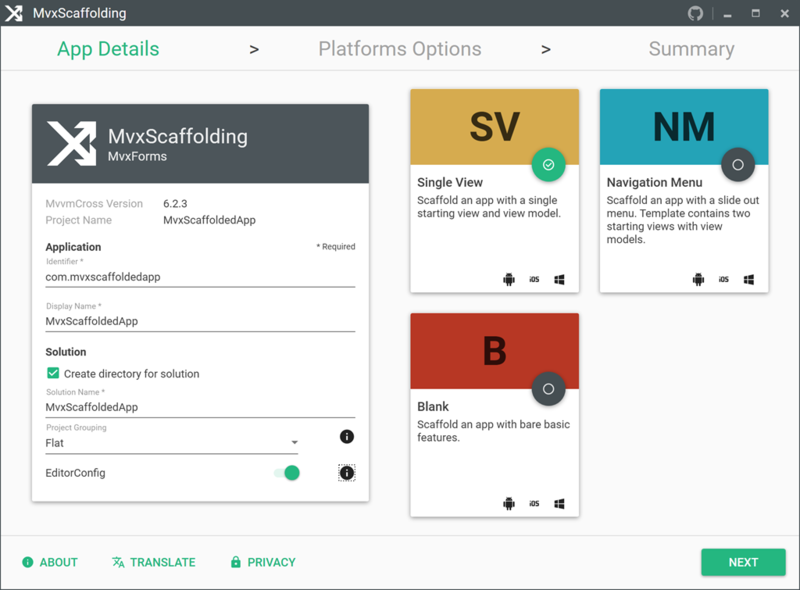 In this post we’ll look at some of the different ways that you can adjust layout based on which target platform the application is running on. 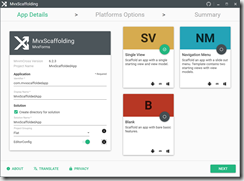 The starting point is to look at an individual element, such as a Label, and how an individual property can be adjusted for different platforms using an OnPlatform element. In this example instead of supplying a value for the FontAttributes attribute we’ve expanded into long form using a Label.FontAttributes element. Nested within this element we create an OnPlatform element, supplying the TypeArguments attribute to indicate what Type of value the OnPlatform is going to produce. 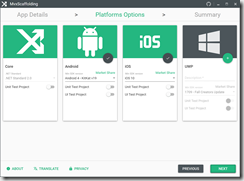 Within the OnPlatform element we then have an On element for each platform we want to specify a value for. This defines a resource, FeatureColor, within a ResourceDictionary, with different colors defined for each of the three platforms. 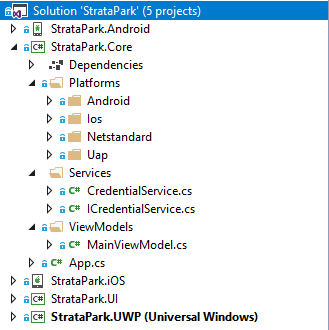 As you can see, defining values for each platform can start to add a lot of bloat to your XAML. 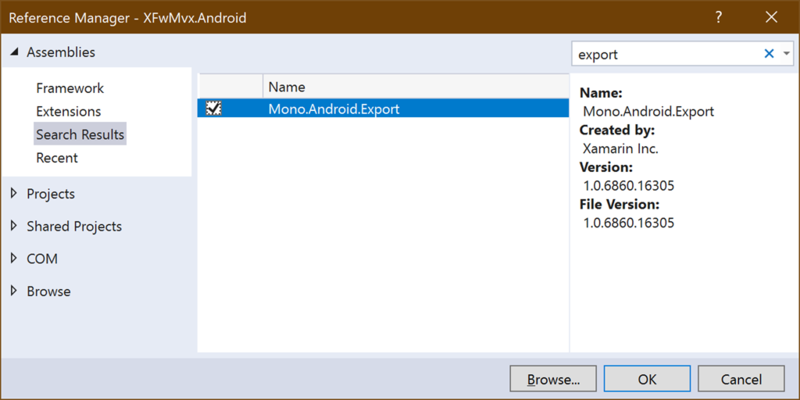 A work around for this is to use a similar technique that we’ve discussed previously where we include files on a per platform basis. For resources this requires a bit of fiddling, so there are a few steps involved. 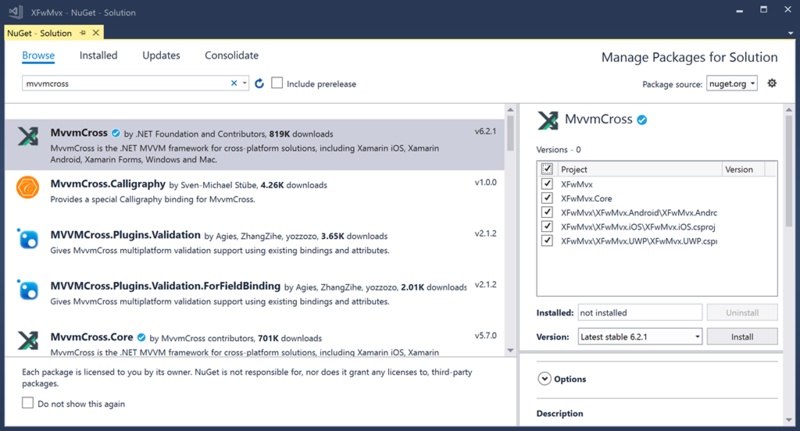 We need to start with the csproj for the UI project and adjust the first ItemsGroup to remove all XAML files that are within the Platforms folder. 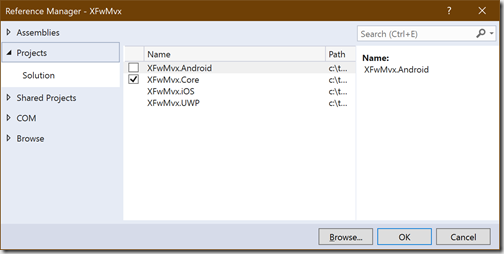 Next we need to selectively add back the XAML files based on what the target platform is. 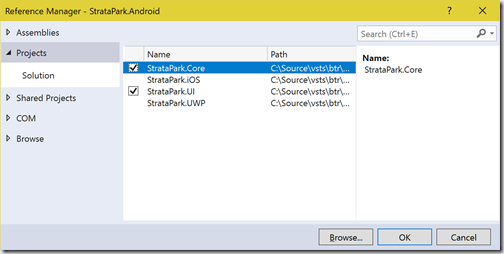 The bold lines in the following XAML from the csproj file indicate these changes. 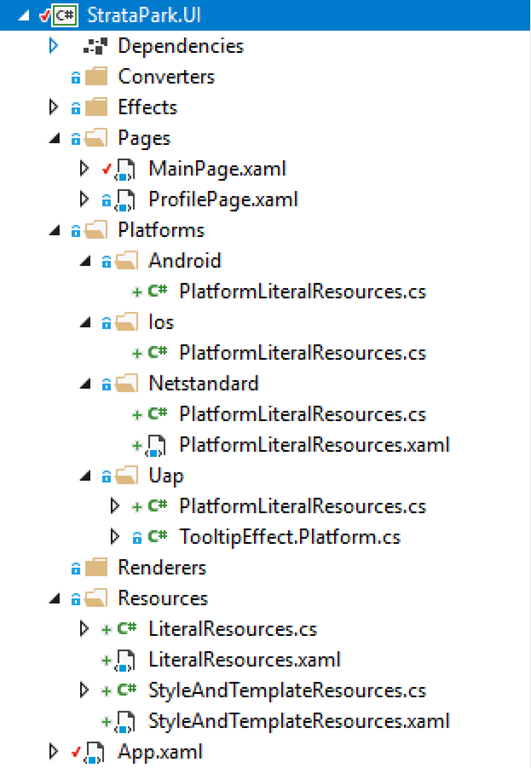 Note that the hierarchy is now App.xaml >> StylesAndTemplateResources >> PlatformLiteralResources >> LiteralResources. And there you have it, you can now define platform specific literals in the PlatformLiteralResources xaml file without worrying about using the OnPlatform element. Last post, on Resources and Styles, we discussed how resources, such as styles, can be defined at different levels within the view hierarchy. 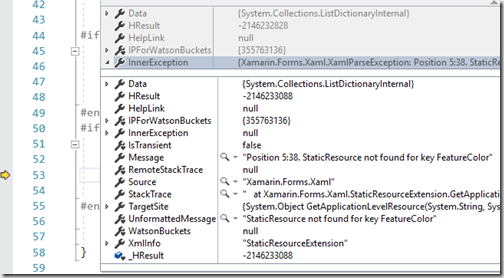 In this post we’re going to cover using resource dictionaries to better manage resources. Let’s start by recapping how resources can be defined by starting with a basic application level resource, which are resources that can be accessed anywhere in the application. A couple of things to note here – firstly we’re defining a resource with the same name as at the application level, which means we’re going to be overriding the resource value but only for this page. 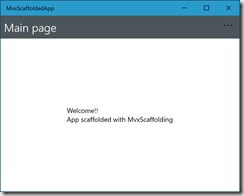 It’s also worth nothing that we’re using Page.Resources, despite the type of the page being ContentPage (for a normal Xamarin.Forms page) or MvxContentPage (for an MvvmCross page). 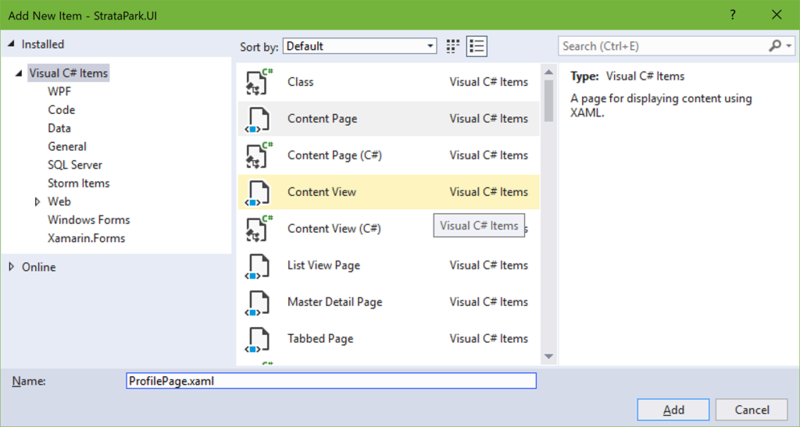 This is acceptable since Page is the base class for both ContentPage and MvxContentPage, meaning that we can use it to reference the Resources property. It’s up to you whether you use Page.Resources or ContentPage.Resources, or even MvxContentPage.Resources, as they all reference the same property. We can continue down the hierarchy, defining resources at either the container, or element level. As before, the resources are only accessible to the element and it’s children where the resource is defined. 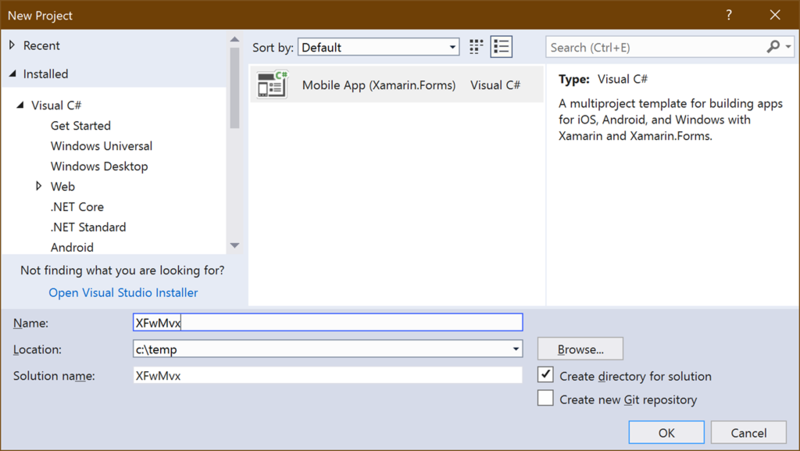 Now that we've seen how we can define resources at any level in the view hierarchy but currently we’re storing all our application level resources into the App.xaml, which overtime is going to get quite hard to manage. One approach to make resources easier to manage is to create separate resource dictionaries for different types of resources. My preference is to have a dictionary that contains literals such a colours, strings, Thickness, converters, and another resource dictionary that has styles and templates. 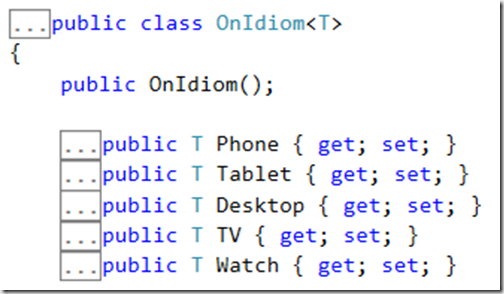 Let’s start by creating a separate dictionary and linking it to our App.xaml. 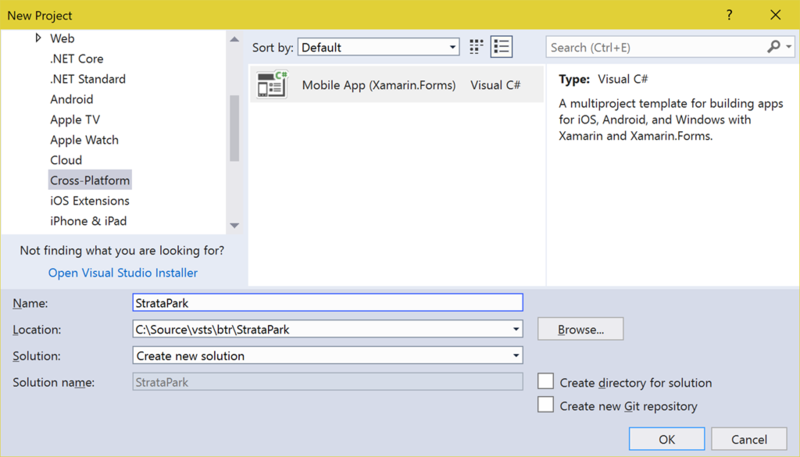 Unfortunately Visual Studio doesn’t currently come with an item template for a ResourceDictionary for Xamarin.Forms. 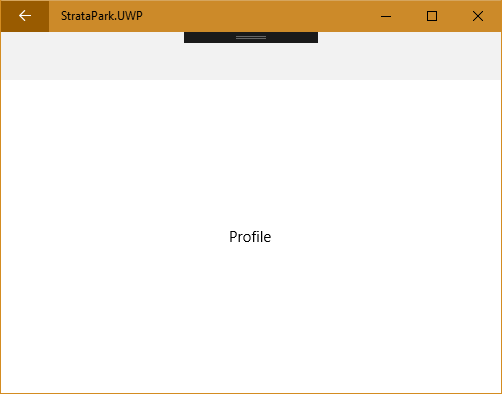 I’m going to create a folder called Resources within the UI project, open the folder in File Explorer and create a new file called StyleAndTemplateResources.xaml. 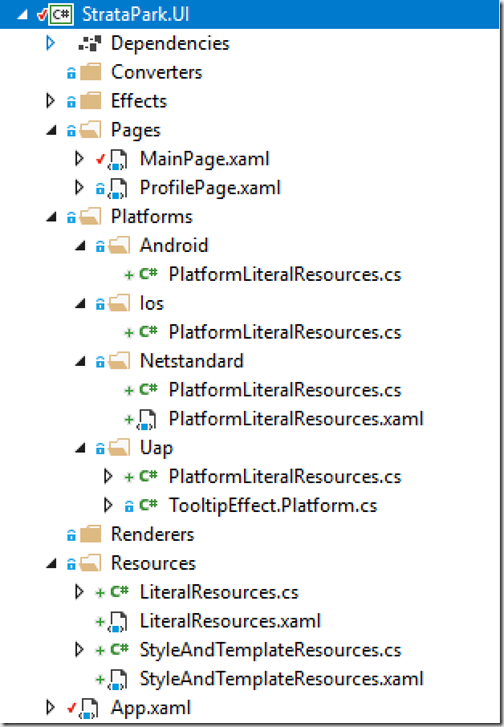 This needs to be referenced in App.xaml to ensure the resources are loaded at application startup. 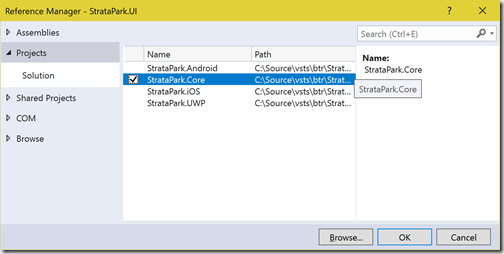 Note that we’re using the new syntax supported in Xamarin.Forms v3+ where we do not need to include the MergedDictionaries tag and we can load the ResourceDictionary based on the path to the XAML. This means that we don’t need to specify the Class attribute in the XAML for the ResourceDictionary; nor do we need the code behind file. Let’s also add another ResourceDictionary which will contain our literals. 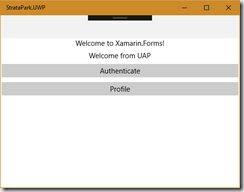 This will follow the same structure as the StyleAndTemplateResources.xaml but called LiteralResources.xaml, and we need to update the App.xaml. As the comment in the XAML states, adding the two resource dictionaries in parallel like this in the App.xaml will not work. 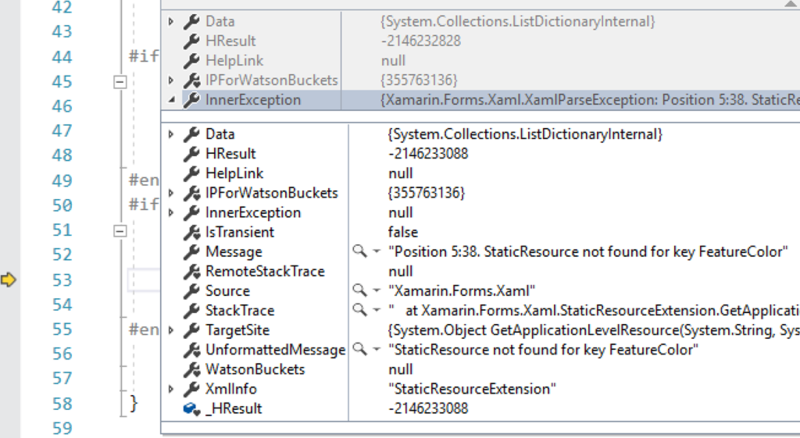 At runtime you can expect a XAML parsing error, stating that resources defined in LiteralResources can’t be found when loading resources in StyleAndTemplateResources. So, the question is – if this doesn’t work, what do you have to do? Well the good news is that we’re on the right track using a hierarchy of dictionaries. 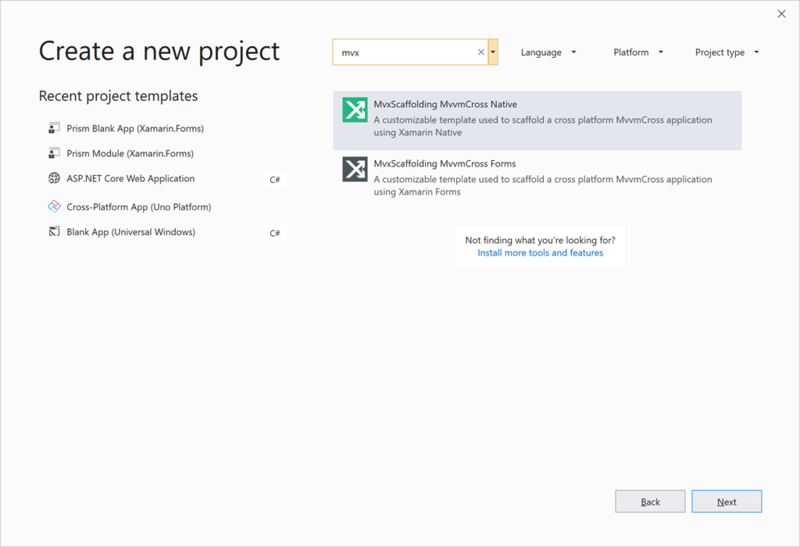 Unfortunately due to some issues with Xamarin.Forms, we can’t use the simplified form, instead we need to make sure that each resource dictionary has a Class attribute and a code behind file, and we need to explicitly use the MergedDictionaries element. 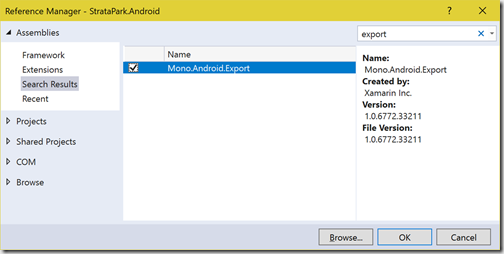 And there you have it – resources are separated out for easier maintainability. 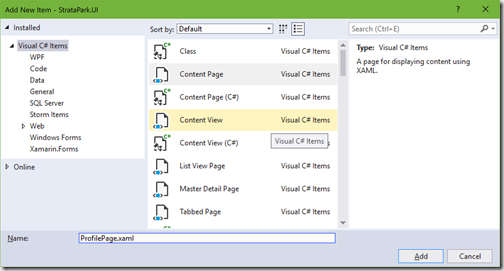 A lot of applications will have all sorts of layout properties set explicitly in the page XAML. Unfortunately this becomes increasingly hard to manage as the application grows. Imagine having 10+ pages all with the colour of elements set explicitly and then you want to change the theme of the application – this would require going through every element to make sure every colour is correct. An alternative is to extract various properties into static resources where they can be managed at an application, page or even control level. 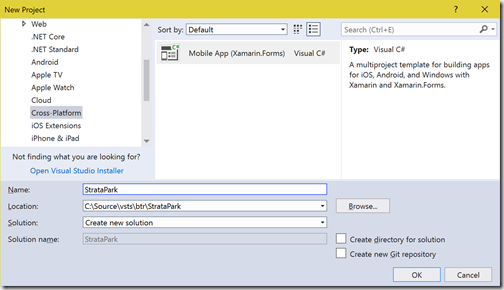 Let’s look at defining an application resource in the App.xaml file in the UI project. In this case we’ve defined a Color resource with a Key of FeatureColor. This can be used anywhere in the application using the Key. Extract properties into resources can be done for all sorts of values such as strings, colours, margins etc. Not all resources need to be defined at an application level. Resources can be added to the Resources dictionary of a Page or even a control (for example a Grid) – this limits the scope of that resource to the element where the resource is defined, and it’s children. 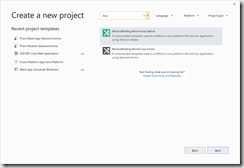 For example, adding a resource to the Resources dictionary of a Page means that the resource is available to all elements on that page but not to elements on other pages within the application. 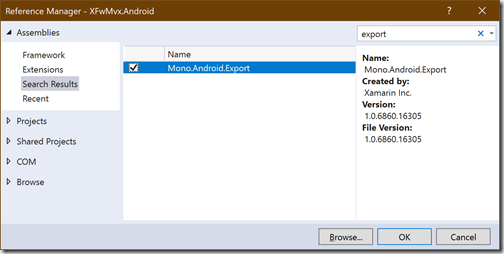 Note: It may seem simpler to add all resources to the Application Resources dictionary – just be aware that there is a performance cost associated with this as all resources will need to be loaded when the application is started up. Depending on the number and complexity of the resources, this can have a negative impact on the startup time for your application. - What if we want to be able to set other common properties across all these Label elements? For example, we might want to set FontSize. - We still have to explicitly set the TextColor on each Label – it would be great if the colour could be set automatically on all Label elements. The answer to both of these is to define a Style, which you can think of as a collection of property setters, applied by setting the Style property of an element. Let’s start with the first issue where we want to be able to set the FontSize as well as the colour. 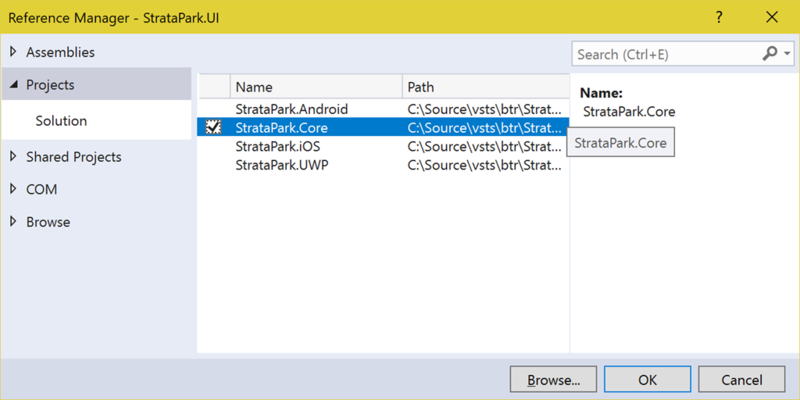 To do this we’ll create a Style called FeatureLabelStyle, again in the App.xaml so it can be used throughout the application. Note that we still have a resource called FeatureColor which specifies the colour of the Label, and we have another resource that defines the size to be used for the FontSize. These are combined into the FeatureLabelStyle, which can then be applied by setting the Style property. Moving now to the second issue, which is how we can apply a Style to all Label elements. Currently the Style we have defined has a Key assigned to it, making it an explicit Style, since the Key has to be used in order to explicitly specify the Style. In order to apply it to all elements we need to define an implicit style, a Style with no Key. The implicit Style will be automatically applied by default to all Label elements. Note that we have based the implicit Style on the previously defined explicit style – this is best practice as it means we can take advantage of Style inheritance. For example you might have a base explicit Style that defined the default colour for all Label styles. 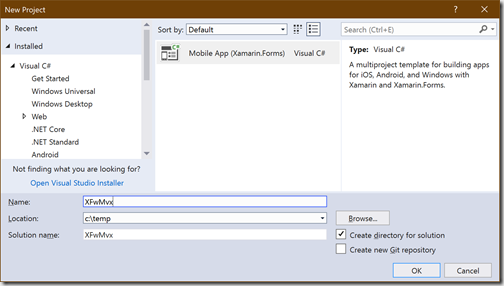 And there you have it, a quick overview of using Resources and Styles within your Xamarin.Forms application. 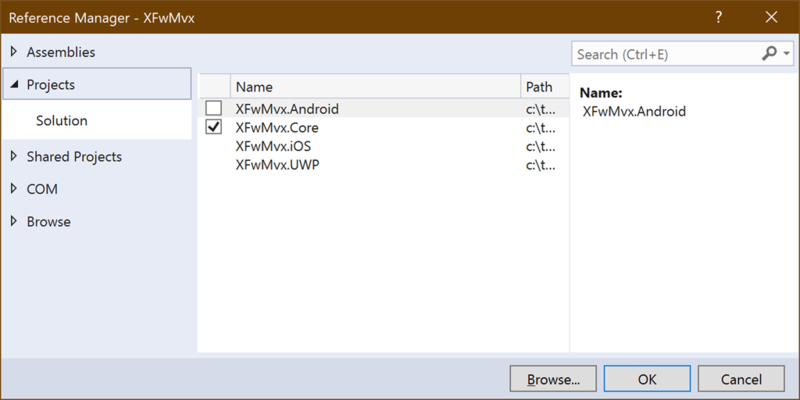 The great thing about MvvmCross is that it provides a minimal effort approach to things like navigation. However, there are times when you want to override the navigation model. For example you might want a page to appear as a modal page instead of a regular page. 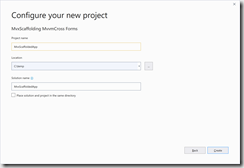 MvvmCross allows you to do this by overriding the default way that a page is presented, which is controlled by a presentation attribute applied to the page. Out of the box, MvvmCross comes with a number of presentation attributes that you can use to control how a page is rendered. 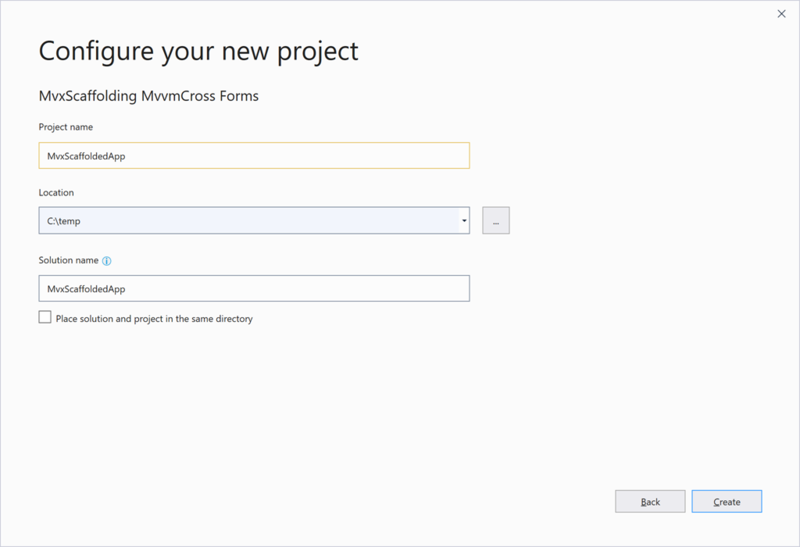 By default, if you attempt to navigate to a page, MvvmCross assumes that you just want to navigate to that page using the Xamarin.Forms PushAsync method. This is the same as if you had attributed the page with the MvxContentPagePresentation attribute e.g. I’m going to change the ProfilePage to appear as a modal page. The only change I need to make is to add the MvxModalPresentation attribute to the ProfilePage class. 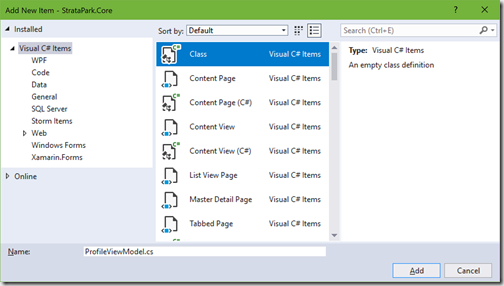 Note: Xamarin.Forms distinguishes between closing a modal page using PopModalAsync vs closing a regular page using PopAsync. Of course, we’d prefer to have the button linked to a command in the view model that can be used to close the corresponding page. The code for the Button and the ProfileViewModel are as follows. 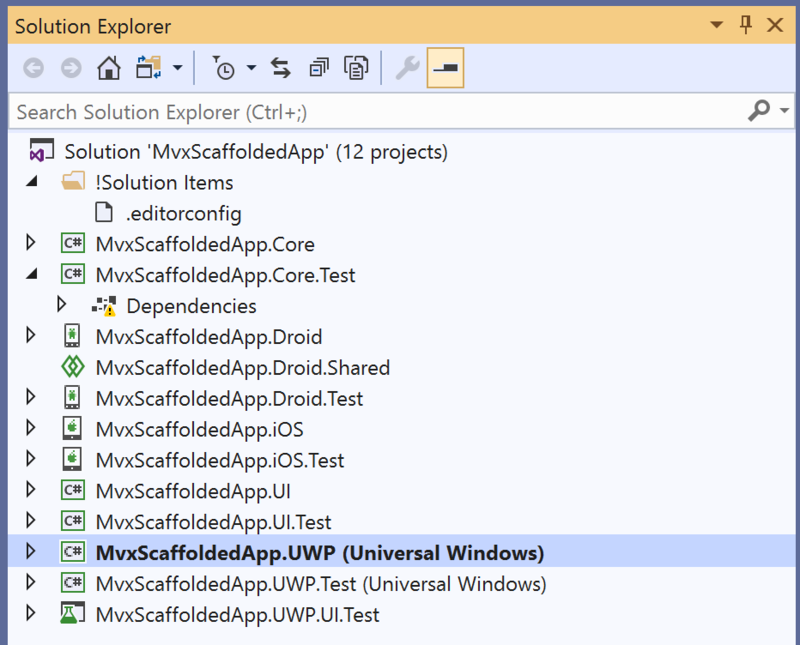 Note: The ProfileViewModel inherits from the MvxNavigationViewModel so that it can access the NavigationService. The NavigationService exposes a Close method which will close the current view model, and the corresponding page. This code is the same irrespective of whether the ProfilePage is shown as a regular or a modal page. 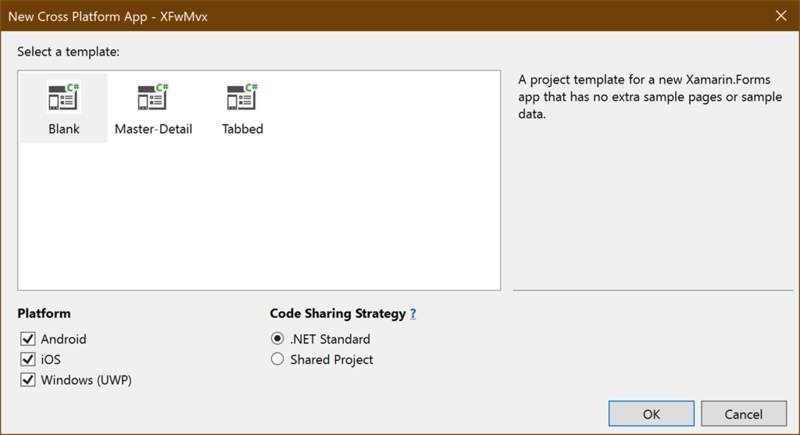 There you have it – you can easily override how pages are displayed in your Xamarin.Forms application using presentation attributes in MvvmCross. 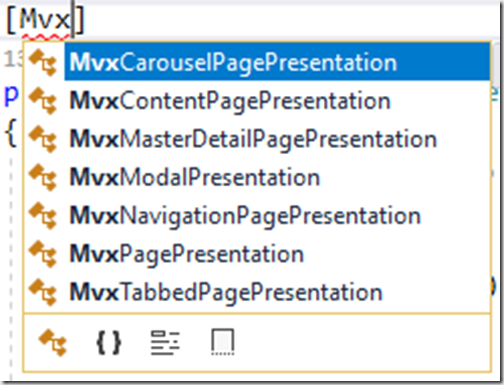 There are other attributes that come with MvvmCross to allow you easily display pages in master-detail, tabbed and carousel layouts. 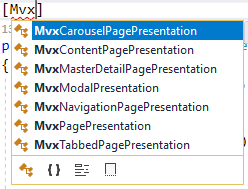 In addition to the built in attributes, you can override the MvxPagePresentation attribute and add your own custom layout logic for how pages are presented. 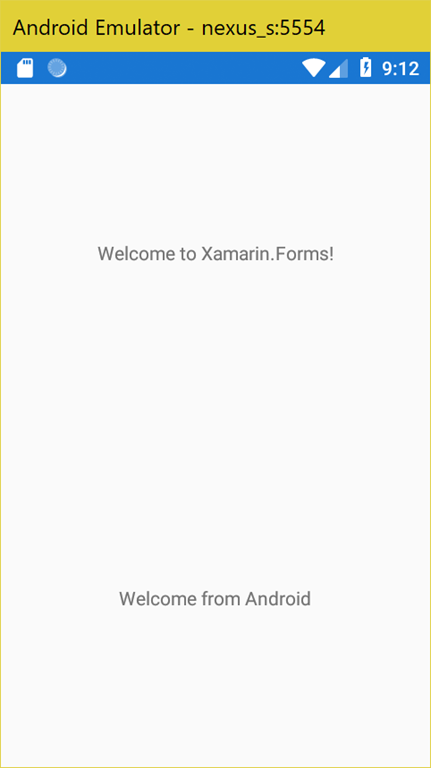 Xamarin.Forms has a built in mechanism for navigating between pages. 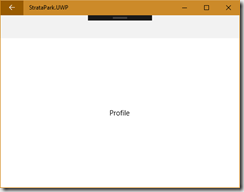 Let’s start with navigating from the MainPage to a new ProfilePage, based on the Content Page item template, added to the Pages folder of the UI project. To trigger the navigation, we’ll add a new Button to the MainPage and add logic to navigate to the ProfilePage. 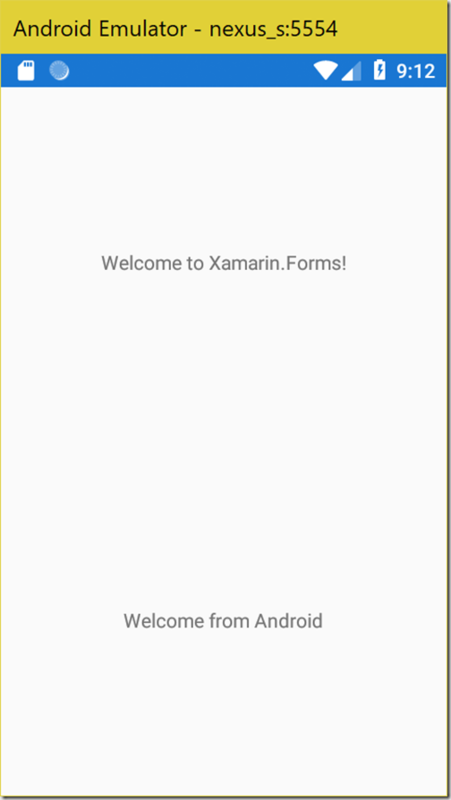 The limitation with the built in navigation model for Xamarin.Forms is that it is triggered in the UI layer (i.e. 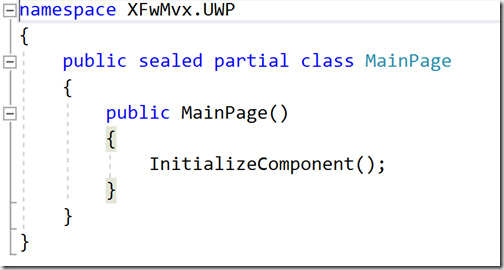 in the code behind of the MainPage). Using MvvmCross we can move the navigation logic into the domain of the view model, meaning it can be tested independently of the UI. To do this, we need to add a ProfileViewModel class, which corresponds to the ProfilePage. The ProfilePage also needs to be updated to inherit from MvxContentPage. 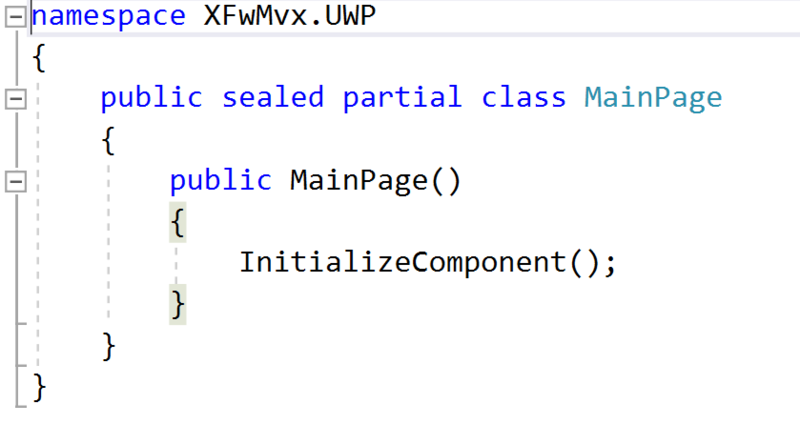 The code in the MainPage can now be changed to connect the button to the ProfileCommand in MainViewModel. 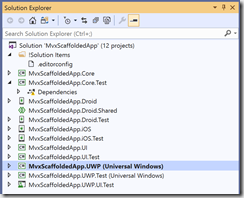 Navigation is now triggered from the ProfileViewModel. Adding the IMvxNavigationService as a parameter in the constructor means that the view model has to maintain a reference to it until it’s used by the ShowProfile method. 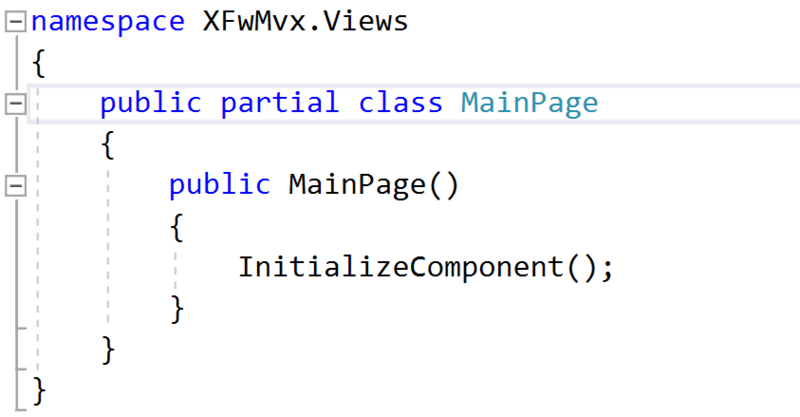 Alternatively, we can change the base class to use the MvxNavigationViewModel which already exposes a NavigationService property. Navigation using MvvmCross provides a nice abstraction away from the UI layer. It can also be customised to display master-detail, tabbed and other page types. 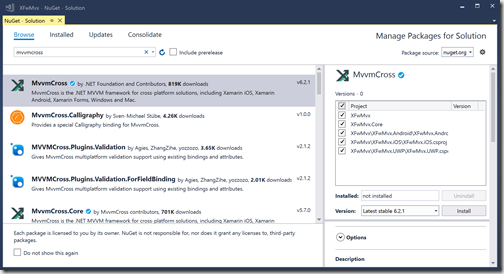 I’ve walked through this a couple of times in the past (last year and in the Mvx+1 series I started) but I wanted to do an updated post to firstly point out that the getting started process in Visual Studio has stabilized quite a lot and the process of getting a new Xamarin.Forms project up and running is quite smooth. 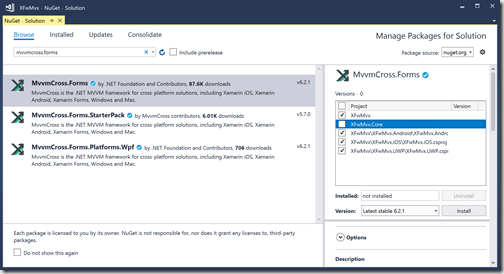 The second thing I wanted to add is how, and why, you can setup your .NET Standard libraries to be multi-targeted – this also has come a long way. Note: I’m running Visual Studio 15.8 preview 5, so your experience may vary a little if you’re running a different version of Visual Studio. Before I get started I try to make sure all my components are up to date, including my MacMini which is what I use for building/debugging iOS applications. 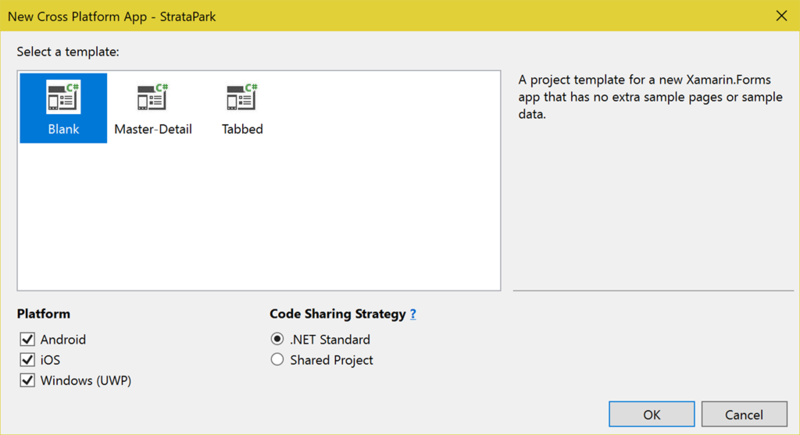 This will prompt you to select what template to use, in this case we’re going to create a project based on a Blank template. In actual fact this template isn’t blank; it has 1 page which is required in order for the application to build and run. 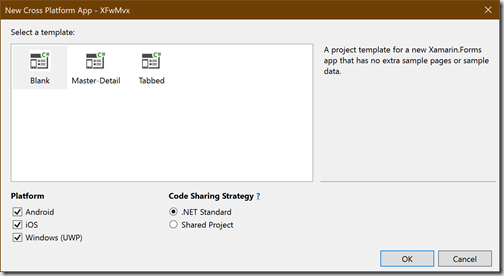 Also, make sure you select the .NET Standard Code Sharing Strategy. DO NOT select Shard Project – this options in my opinion should now be deprecated as multi-targeting is a much better option for achieving this same outcome. After clicking OK to create the project, you’ll want to make sure you can successfully build all projects. 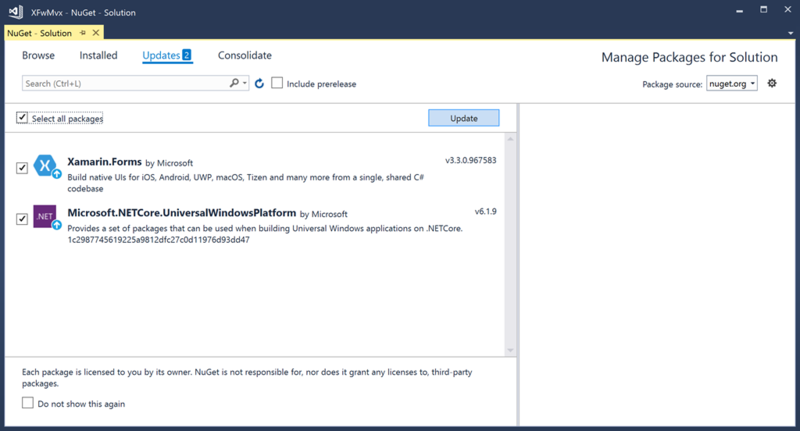 Next open the NuGet package manager for the solution and update all packages to the latest stable. In my case I just had to update Microsoft.NETCore.UniversalWindowsPlatform and Xamarin.Forms. Now, make sure that each platform (i.e. 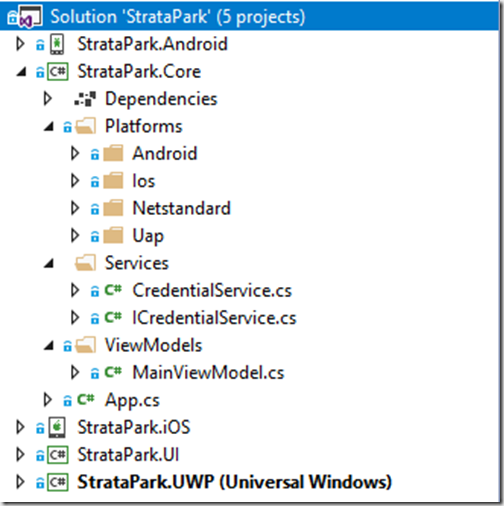 iOS, Android and UWP) compiles and runs. Technically you don’t need to do this but if you run into difficulty later, at least doing a run check here gives you a “last known good” state to revert to. 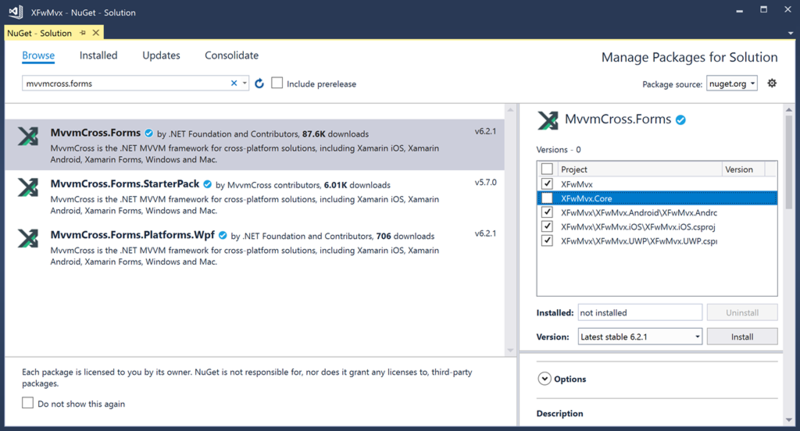 On that note, after checking that each platform runs, I would be making the initial commit to source control for your solution. 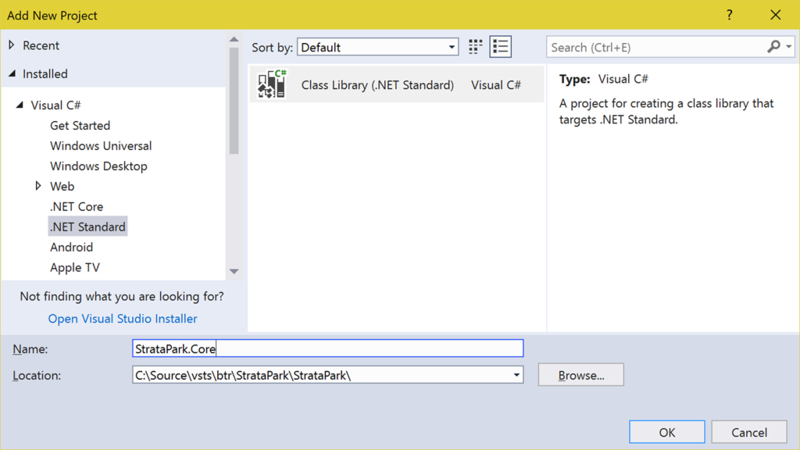 Next we’re going to add a new project based on the Class Library (.NET Standard) project template. This will be our Core project that will contain all our view models, services and business logic for the application. The new project will come with Class1. Rename both the file and class name to MainViewModel. Now’s another time to check that everything builds and runs (all three platforms) and then commit your changes! 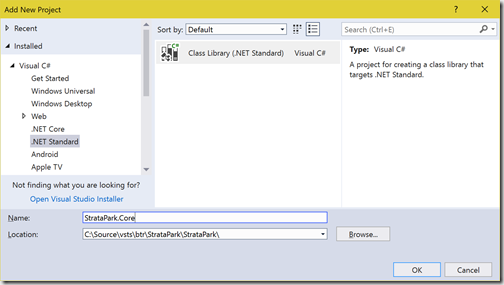 Both the Core and UI projects are currently just .NET Standard 2.0 projects. This means that all code is the same for all platforms. By making these projects multi-targeted, we can enable platform specific code to be included where necessary. This is similar to the way shared libraries used to work. However, the difference is that the code stays in a separate assembly, away from the head projects. If you take a look at the code that was added to the csproj, you can see that there are some conditional inclusions based on the target platform. We’ll make use of this to return a platform specific welcome text for our application. 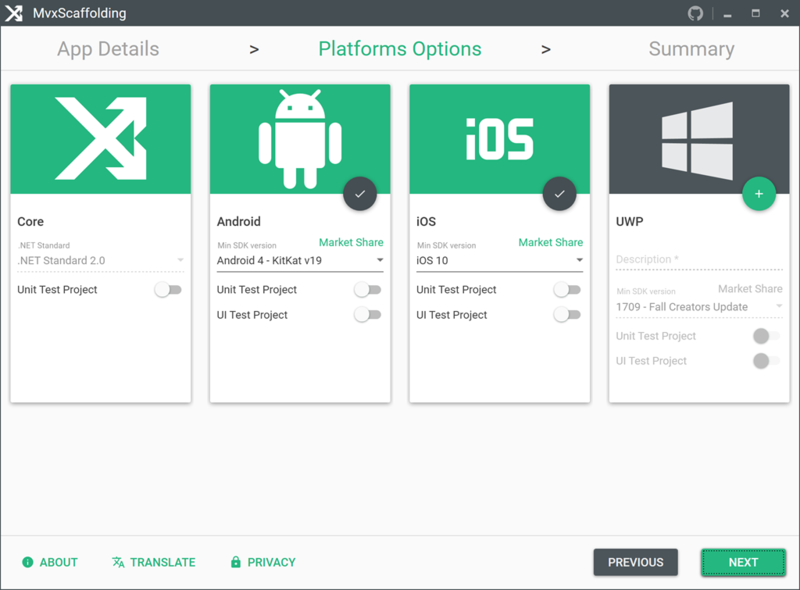 Now when we build and run the application on each platform, we’ll see a platform specific welcome. This technique can be used to include all sorts of platform specific code within your application, making it easier to deal with the Mvvm abstraction when you need to tie into platform specific APIs. In the past you’d have typically had to create a service in the head project, or some other clumsy workaround.